I only knew that the Bosmans existed because Grandpa told me that this photo was John Bosman. Hmm. I have no idea what that means. I spelled the name “Bosman” incorrectly because Grandpa pronounced it “Bussman,” and I either didn’t ask how to spell it or he didn’t know. Aunt Jen is Jennie DeKorn Leeuwenhoek, Richard DeKorn’s daughter, the sister of my great-grandmother. 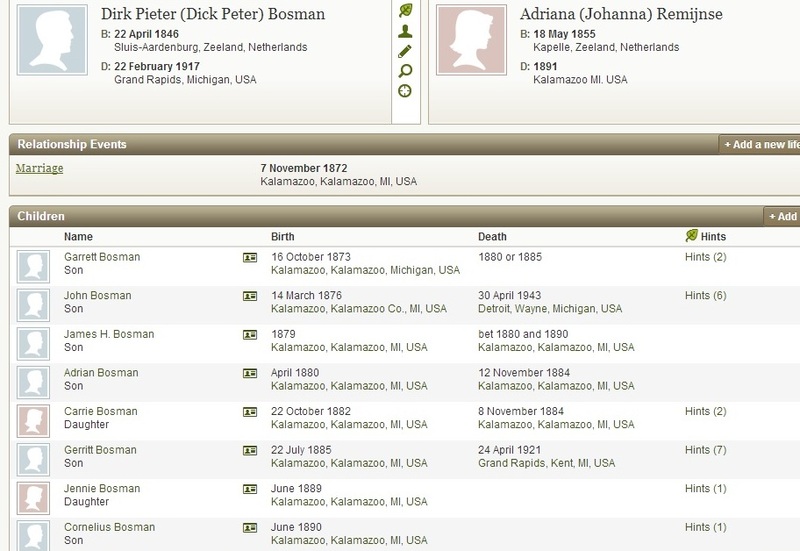 The matriarch of the Bosman family was Adriana (also called Johanna and Jennie–very confusing) Remijnse or Remynse. She was my first cousin 4x removed. She married Dirk Pieter Bosman, and John was one of their children. Grandpa told me that John was the oldest child, but according to the following information, there was another son, Garrett, who died between the ages of 7 and 12. Dirk and Johanna/Adriana gave birth to eight children. At least four of them died as children. 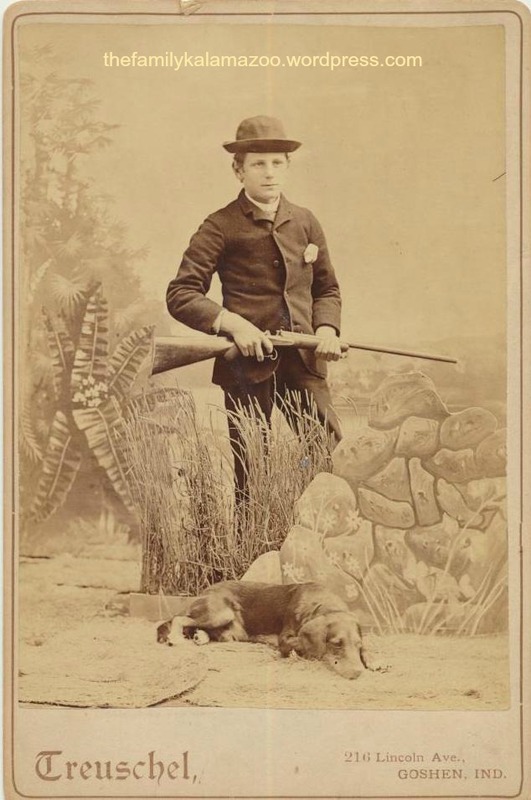 In this photo, John looks like a boy who likes hunting. He was born 14 March 1876 in Kalamazoo. 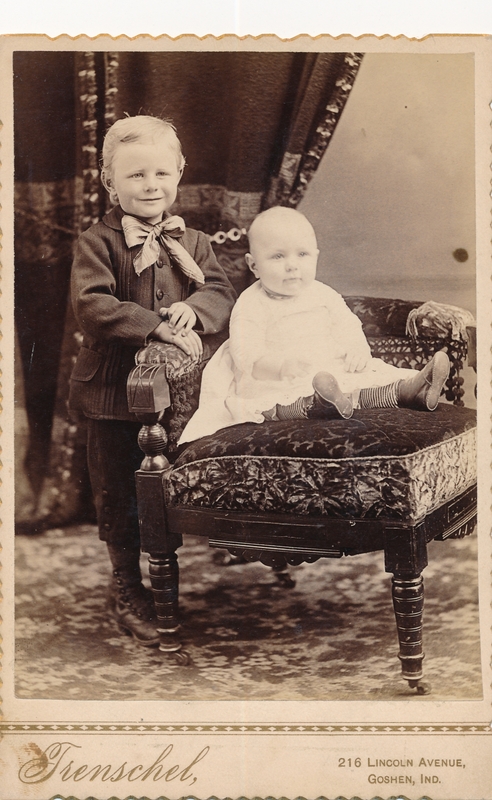 He grew up to marry Nellie Robb on 14 May 1903 in Windsor, Canada. On 30 April 1943, he passed away in Detroit. Please note that Windsor and Detroit are right next to each other, although they are in different countries. Back to what I wrote on the back of the photo. Grandpa said Aunt Jen went to Second Reformed Church on Park Street, not that his mother did. The story he told me was that his mother donated a quilt to the church (Second Reformed or a different Reformed Church?) and saw a woman hanging it on her own clothesline, signifying that the woman had appropriated the quilt. Great-Grandmother Cora quit going to her church after that incident. I’ve looked online for a photograph of Second Reformed Church on Park Street, but cannot find anything. It is probably gone, but I hope to find a photo eventually.